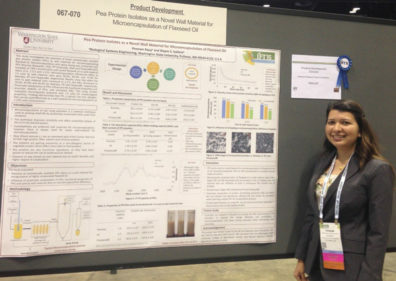 Poonam Bajaj, doctoral student in Biological Systems Engineering, has won first place in the student poster competition for the Product Development division of the Institute of Food Technologists (IFT) 2015. This research program is supported in part by the Bill and Melinda Gates Foundation, WA, the USA Dry Pea and Lentil Council, WA and a grant from the Washington State University, College of Agricultural, Human, and Natural Resource Sciences, Agricultural Research Center. Poonam’s committee members include professors Juming Tang and Girish Ganjyal. Poonam completed her bachelor’s degree in Food Science and she is recipient of best student award based her academic and extracurricular performance. She received her master’s degree in Food Engineering and Technology from Institute of Chemical Technology, Mumbai India before starting her Ph.D. at WSU in spring 2013. She received Puget Sound IFT Travel Award and ranked third in Biological Systems Engineering poster presentation competition. The IFT is a leading international society in food science and technology. The winner was selected from 35 entries from the top food science and technology programs worldwide. Second and third place honors went to students from University of Minnesota and University of Florida.